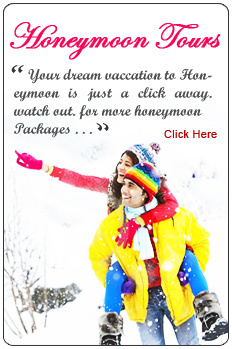 Shimla is one of the most famous hill stations of India. Almost everyone you know would have been there and has a story to tell. 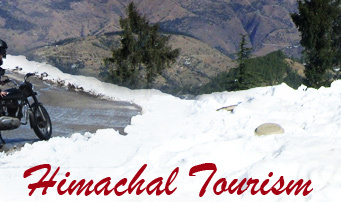 The capital of Himachal Pradesh, and erstwhile summer capital of British India, is today a subtle mix of old and new five star hotels in old colonial buildings, Raj era memories while you walk down the famous Mall, and most of all Himachal hospitality- these are some of the trademarks of this gateway. The place is sporting a new look as the government has taken stringent steps for preservation of old heritage buildings and the area around the Mall too is spick and span, thanks to the no vehicles rule put into place. So it's mostly walk, walk and more walk in Shimla. In 1864, Shimla was declared the summer capital of the erstwhile British Raj in India. 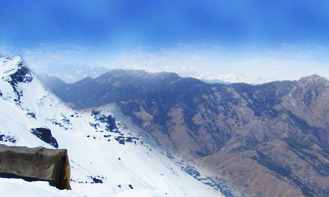 A popular tourist destination, Shimla is often referred to as the "Queen of Hills" (a term coined by the British). Located in north-west Himalayas at an altitude of 2,130 meters (6,988 ft), the city of Shimla, draped in forests of pine, rhododendron and oak, experiences pleasant summers and cold, snowy winters. The city is famous for its buildings styled in tudorbethan and neo-gothic Shimla is located in the north-western ranges of the Himalayas. At an average altitude of 2397.59 meters (7866.10 feet) above sea level, the city is spread on a ridge and its seven spurs. The city stretches nearly 9.2 km from east to west. 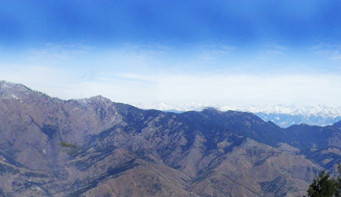 The highest point in Shimla, at 2454 meters (8051 feet), is the Jakhu hill. Shimla is a Zone IV (High Damage Risk Zone) per the Earthquake hazard zoning of India Weak construction techniques and increasing population pose a serious threat to the already earthquake prone region. There are no bodies of water near the main city and the closest river, Sutlej is about 21 km (13 miles) away. Other rivers that flow through the Shimla district, although further from the city are Giri, and Pabbar (both are tributaries of Yamuna. The green belt in Shimla planning area is spread over 414 hectares (1023 acres). The main forests in and around the city are that of pine, deodar, oak and rhododendron. Environmental degradation due to the increasing number of tourists every year without the infrastructure to support them has resulted in Shimla losing its popular appeal as an ecotourism spot. Another rising concern in the region is the frequent number of landslides that often take place after heavy rains. Architecture reminiscent of the colonial era. 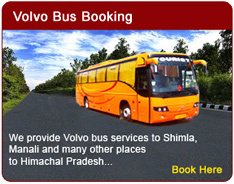 Shimla is connected to the city of Kalka by one of the longest narrow gauge railways routes in India. Shimla is approximately 115 km (71.4 miles) from Chandigarh, the nearest major city, and 365 km (226.8 miles) from New Delhi, the national capital. The city is named after the goddess Shyamala Devi, an incarnation of the Hindu Goddess Kali. The Mall: The Mall is the main shopping centre of Shimla. It also has many restaurants, clubs, banks, bars, Post Offices and tourist offices. The Gaiety Theatre is also situated there. People walk up and down the Mall slowly, stopping to gossip, as it is the main meeting place for everyone. The Ridge and Scandal point are the two main meeting points at the Mall. Christ Church: Situated on the Ridge, Christ Church is the second oldest church in Northern India. It has a very majestic appearance and inside there are stained glass windows which represent faith, hope, charity, fortitude, patience and humility. Christ Church is a place all visitors should spend some time in. 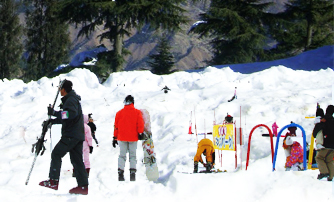 Jakhu Hill: 2 km from Shimla, at a height of 8000 ft, Jakhu Hill is the highest peak and offers a beautiful view of the town and of the snow-covered Himalayas. At the top of the Hill, is an old temple of Hanuman, which is also the home of countless playful monkeys waiting to be fed by all visitors. Shimla State Museum: The Museum, which was opened in 1974, has tried to project hill-out and the cultural wealth of the state. There is a collection of miniature Pahari paintings, sculptures, bronzes wood-carvings and also costumes, textiles and jewellery of the region. Indian Institute of Advanced Study: This institute is housed in the Vice Regal Lodge, which was built in 1884-88 during the British times. It has spacious gardens and is ringed by beautiful pine trees. All is calm and serene just the right atmosphere for a student of literature or politics. Summer Hill: Situated at a distance of 5 km from the Ridge is the lovely township of Summer Hill at a height of 6,500 ft on the Shimla-Kalka railway line. Mahatma Gandhi lived in these quiet surroundings during his visits to Shimla. Himachal Pradesh University is situated here. Annandale: Developed as the playground of Shimla, Annandale is 2-4 km from the Ridge at a height of 6,117 ft. It is a favourite spot for cricket, picnics and the princely game of polo. Tara Devi: 11 km from the Shimla bus-stand. Tara Devi has a temple dedicated to the goddess of stars on top of the hill. There is a military Dairy Town here as well as the headquarters of Bharat Scouts and Guides. At a height of 6,070 ft, Tara Devi is an ideal place for a person wanting peace and some rest. Sankat Mochan: A popular Hanuman temple is located here. We get an excellent view of Shimla from the temple. It can be reached by car or on foot. Junga: Junga is a tehsil in the picturesque district of Shimla, Himachal Pradesh. Its original name (with diacritics) is Junga. Located at a distance of 26 km from Shimla, this place is known for a palace and museum of erstwhile Junga Princely state and its scenic beauty and the numerous easy to hard treks it offers. Junga is surrounded by green hills with snow capped mountains and has a forest cover of Kail, Deodar, Pine, Kedar, Oak, Rhododendron, Cheel, Ban and other trees. The princely state of Junga also known as Keonthal Estate was formed before 1800 AD. Raja Veer Vikram Sen, is the current Raja of Keonthal since the 13th of December 2002. 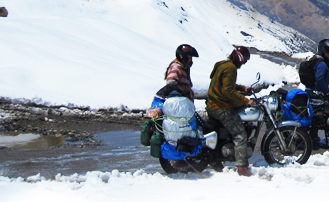 Junga is designed for Eco Adventure tourists. Junga has couple of resorts designed for maximum staying comfort and with all facilities and luxuries but the essence has been to touch the natural space as little as possible. Easy accessibility and many other attractions makes it a popular eco-adventure destination. 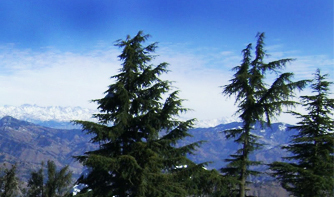 Mashobra: 13 km away from Shimla, Mashobra has several excellent picnic spots. Mashobra is the site of the annual Sipi fair in June. The nearest rest house is at Craignano which is 3 km from Mashobra, and is a beautiful holiday resort.